What types of changes are you trying to implement in your organization? How is it going? Are your managers and staff actively participating in the change effort? Did you know that if they aren’t that they are far less likely to adopt the upcoming changes? The one thing that remains constant in organizations is change! Whether these changes are related to new strategic direction, targeted performance improvement, or full-blown business transformation, it’s not uncommon for more than 80% of these organizational change efforts to fail to achieve their intended business results. Whether they’re not on time, go way over budget, or simply don’t deliver their intended outcomes, that’s not good odds for your strategic change efforts! Proactively managing these changes with proven change management tools and techniques greatly improves your odds for success. How do you keep the changes you implement from failing? Plus Delta developed the Positive Change℠ approach to make sure our clients are in the 20% that do succeed. That is why our clients regularly create smoother transitions, gain greater return on investment, and ultimately produce better business results. Under the right circumstances, these change efforts can even be positive and enjoyable experiences that everybody embraces rather than turn into “management mandates” that everybody fears. Do you want to pay now, or pay later? No matter how you approach it, Change Management is a “pay now or pay later” scenario. Either you invest the time and energy required to proactively manage the change process now, or you will likely revisit your choice not to do so later and often times have to do it all over again – albeit with more rigor and discipline, and at even greater cost! What types of changes are you trying to implement? How is your system implementation going? Is someone actively sabotaging your implementation? Maybe resisting the changes in a more passive manner… Are your managers and staff actively participating in your strategic culture change effort? If they aren’t, they are far less likely to adopt the upcoming changes! Give us a call so we can help you implement some positive changes and produce better business results. Click here for a short and insightful article on Change Management and the power of communications. 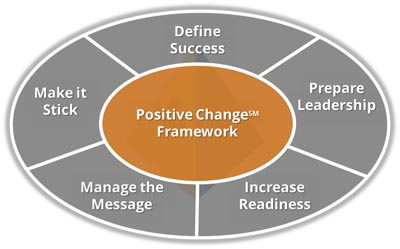 Or click here for a checklist to implement positive changes in your organization.